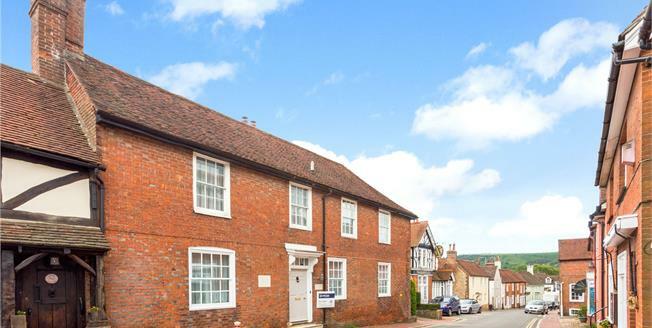 Enjoying a central setting in the sought-after village of Ditchling, Sopers has an attractive front aspect onto the High Street, surrounded by the village’s plentiful amenities. Built in the 18th century, the property has significant historical interest having been the former home of the renowned Arts & Crafts sculptor Eric Gill, who resided in the house from 1907-1912. Character features abound, including wooden eaves cornicing and exposed beams throughout, earning the property a Grade II listed status. The house is arranged over three floors, with well-presented interiors decorated in a traditional style befitting the age and rich history of the property. On the lower floor there is a cellar, while on the ground floor the flexible floor plan comprises a large entrance hall, family room, sitting room, dining room, and kitchen/breakfast room with attached utility. The front facing rooms have attractive sash windows and views out onto the picturesque High Street, while there are views of the South Downs from the south side of the house. The kitchen is a particular highlight, appointed with tiled floors, an AGA and country-style units. On the first floor there are three double bedrooms including a master bedroom with en suite and one single bedroom, as well as views of the South Downs. Situated in the very heart of the picturesque downland village of Ditchling, the High Street offers immediate access to the variety of local shops, including arts and craft workshops, a museum and Post Office, plus The Larder, an excellent delicatessen selling local produce, and cafes such as The Green Welly. In addition, there are well-regarded pubs including The Bull and The White Horse, a village church and a primary school. A wider range of shops can be found in Hassocks (2 miles), which also has a mainline train station to London Bridge/Victoria (approximately 55 minutes). The city of Brighton is situated on the south coast (9 miles). The M23/A23 provides good access to Gatwick and the national motorway network. Rare for a property in the centre of Ditchling, the house benefits from its own driveway with private parking for several cars and a detached double garage located behind a set of arched gates, concealed from the road. Additionally, the rear garden is of an excellent size for a home on the High Street, comprising a large lawn enclosed by an attractive high brick wall, a number of tall trees and a charming patio for outdoor entertaining with views of the South Downs.